2014 was a bad year for gaming. Rather than rant about it for a half an hour, I will simply say that 2014 was the year developers appeared to stop caring. Broken games shipped almost weekly, gamers were nickle-and-dimed for underwhelming DLC, and games seemed to focus more-and-more on grandiose cinematic sequences than actual gameplay. It felt like the year that fun died. Still, I just can’t break the habit of strolling down the gaming aisle every time I go grocery shopping. 2014 was the year I left with just food more times than not. My bank account was pleased, but my persistent desire to game was not. My last re-supplying trip was different, however, and I began 2015 with one of my best gaming purchases in recent memory. I saw a lone copy of Centipede: Infestation sitting on the clearance shelf next to a slew of forgettable Wii shovelware (there were no less than twenty copies of The Black Eyed Peas Experience). It was ten bucks and it looked terrible, so if nothing else it was more ammo for curmudgeonly fodder about the belittling of classic game franchises. I let it sit around for a few days and then finally decided to pop it in my dusty Nintendo Wii. Four hours of non-stop gameplay later, I realized that it might be more fun than anything I played in 2014. Score one for the new year. 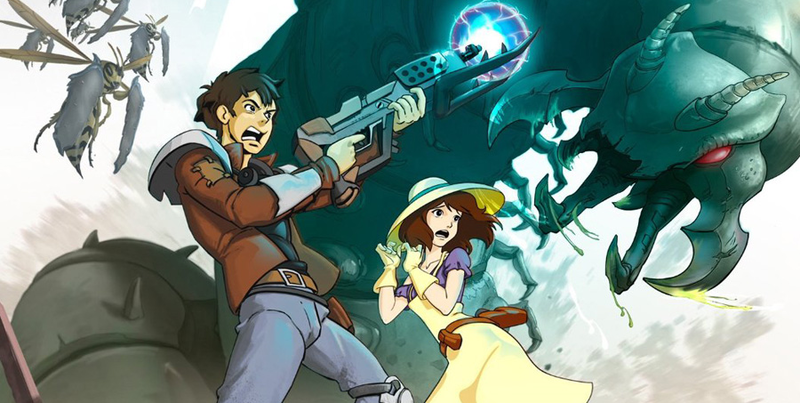 The game was actually developed in 2011, which was as pointless time as any to release a game for the Wii, but hey, I’m glad this one made it out. It was developed by WayForward Technologies, who also crafted the excellent DuckTales: Remastered in 2013. Centipede: Infestation oozes retro sensibilities without ever feeling outdated. It actually plays a bit more like an updated version of Robotron: 2084 with a few nods to Centipede thrown in for good measure. It’s a shame that the franchises belong to different rights holders because marketing this as a mashup game titled Centipede: 2084 would have been infinitely cooler. Centipede: Infestation plays out in classic twin-stick shooter style fashion. 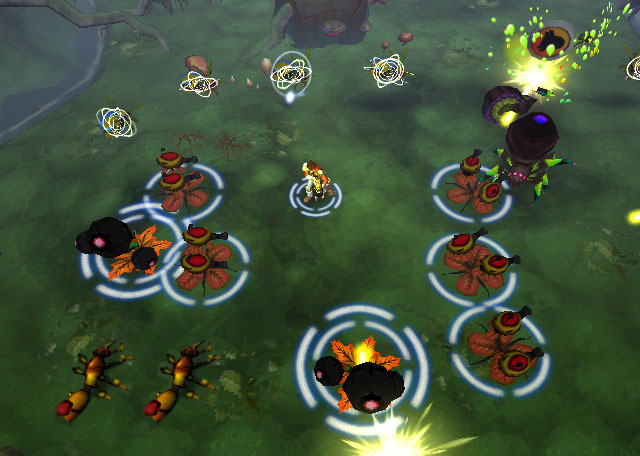 You play as protagonist Max Riot (awesome name) whose sole objective is to kill lots and lots of creepy bugs. You can utilize traditional Robotron-style controls via the Wii’s Classic Controller, but I actually preferred using the Wii remote and nunchuk combo, where the latter is used to move Max and the former to aim your shot. That’s right, I chose to use motion controls. That might be the biggest shocker in all of this. The controls are incredibly precise with the Wii Remote Plus, and methodically taking out huge swarms of mutated insects while simultaneously dodging their projectile fire is incredibly satisfying. Special power-ups drop throughout the course of each stage, the best being a flamethrower (never a bad idea) and a sweet laser beam that is capable of clearing out a whole screen of enemies in seconds. 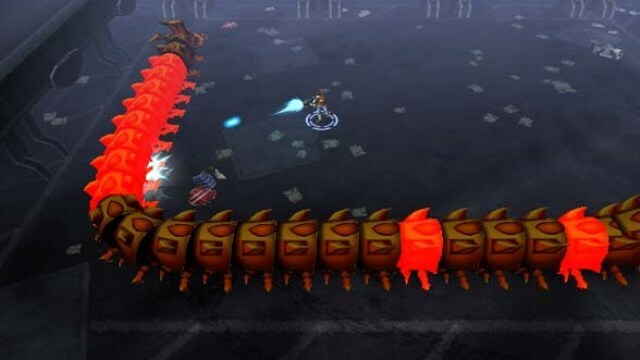 The only obvious inspiration from the game’s namesake is the giant centipede that appears in each stage, usually at the end. It will keep splitting as you shoot it, until the body has been assimilated and just the head is left to take the final blow. The levels grow larger in size and complexity as the game progresses, but the core gameplay always remains the same. I love the old-school arcade feeling that this game exudes, and it kept me hooked until I had finished the game. Infestation‘s length may be its only flaw; clocking in at around 4 hours. That said, there are two additional difficulty modes that pack a greater challenge. Given its 80’s arcade-style gameplay, however, I don’t see it’s short campaign as a detractor. I kept coming back just for the thrill of the high score chase; just like the arcade classic it was named after. There are short story cinematics between levels, but you can (and will) skip them because you don’t need a reason to shoot bugs; you just do it. If an entire year of being force fed bad, broken, and uninspired games has got you down, Centipede: Infestation might just be the thing to cure you of your gaming woes. You can pick it up at Amazon for a cool $8.99, so go ahead and blow of that half-inch of dust off your Wii and get ready for one of the most purely enjoyable arcade-style gaming experiences ever crafted.